Ok, so I changed my mind on the scarf I mentioned last week. Thankfully I only had like 3 rows done so frogging was easy. I'm making a vest instead. That's in the center of the back. It's a basic ripple pattern. The pattern is written very poorly though which is disheartening. 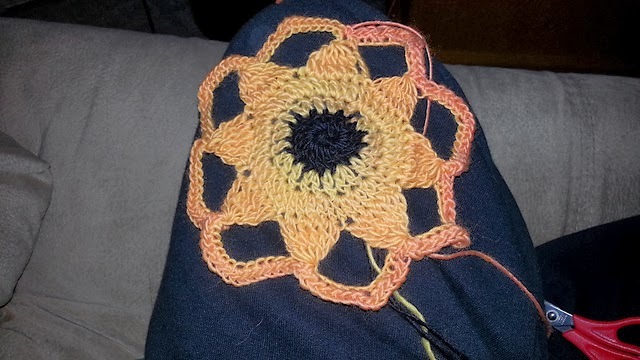 But this yarn has been slated to be too many things so far, so I am sticking with this, dang it!!! I started another WIP over the weekend. The basement. (Cue dramatic music) It's gonna be a bear. We're building a wall, tearing out old wiring, putting up some facing on the stairs.... the list goes on and on. I got as far as purging, reorganizing a few things and some demo. I tore down some rotted built-in shelves and found this mystery hose that ran the perimeter of the basement but wasn't actually connected to anything. Yeah. So it's underway now. My goal is to have it done by spring. Lofty ambitions, but half finished projects irritate me senseless, so I'm motivated for sure. I took a lot of before photos, so hopefully I'll have some great pictures to share in a few months! !